This is what happens to an organization that does not understand the market and does not change with the times. People still like movies, but they obviously don’t need to go to a store to get it nor wait to receive them in the mail. Most people download movies or rent them online through Netflix, AppleTV, Amazon, and more. It could be said the same thing for any ministry/church out there. People still love the gospel message. However, if we are not willing to change our approaches, not to be confused with beliefs, our ministries and churches can suffer as a result. If we do things a certain way “because we always have done it this way”, we actually create barriers to the gospel message. 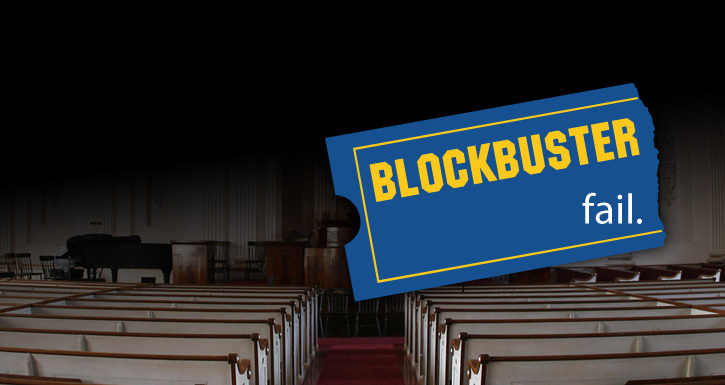 Let’s try to avoid blockbuster failures in ministry. Here is the press release on the Blockbuster closure.